This example compares the in-sample goodness of fit of the DCC (MVN, MVT),and GO-GARCH(MVN, maNIG) model using the test of Hong and Li (2005). Because this is a univariate test, a set of randomly weighted vectors are used to create the weighted margins on which the Probability Integral Transform (PIT) is calculated for use with the test. This example is intended to highlight some of the methods and properties of these models as implemented in the rmgarch package. Note in particular how the weighted semi-analytic density of the GO-GARCH with maNIG distribution is calculated via the convolution (via FFT) method, the resulting object of which can then be passed to custom density (dfft), distribution (pfft), quantile (qfft) and sampling (rfft) functions. This application takes some time to calculate since every point in the insample weighted density has to be calculated for every weighting vector. In practice, it is usually the n-ahead forecast which is of interest on a fixed weighting vector which should be quite fast to calculate. In any case, the problem is separable and benefits from parallel computation. # set(in practise should be 1000+ randomly weighted portfolios). On the whole, none of the models fits the underlying dataset for this long period very well, as can be seen from the Portmanteau statistic (W) which is well outside the 5% significance level. The individual moment tests are not particularly indicative of the reason for this rejection since all models fall within the acceptance region. 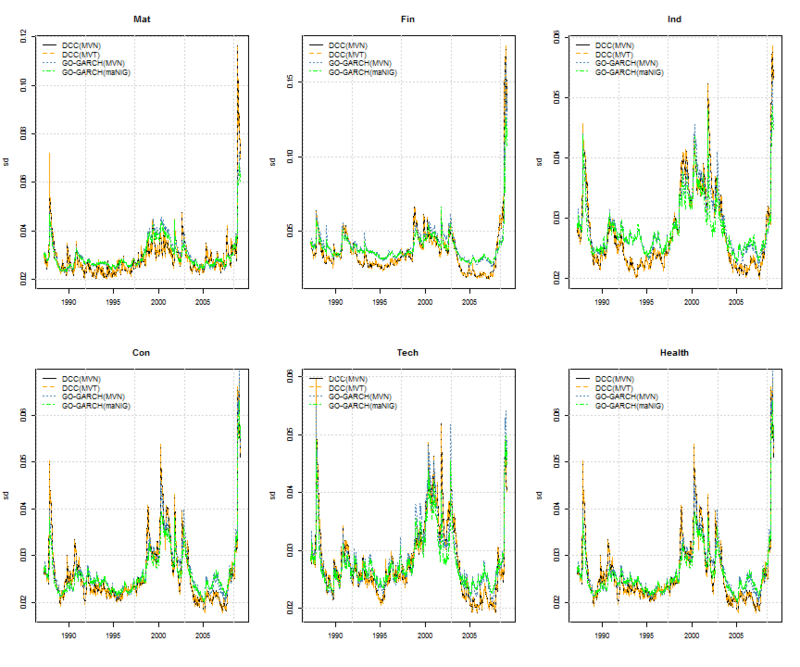 The GO-GARCH models appear to fare slightly better when it comes to the third and fourth moment conditional test (M(3,3) and M(4,4)), while the DCC models fare better in the first conditional moment test (M(1,1)) which may be the result of the AR dynamics being jointly estimated with GARCH in the first stage estimation of these models. Hong, Y., & Li, H. (2005). Nonparametric specification testing for continuous-time models with applications to term structure of interest rates. Review of Financial Studies, 18(1), 37-84.